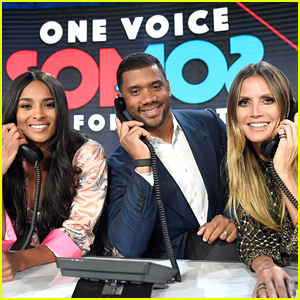 Heidi Klum, Ciara, and Russell Wilson take donations during the One Voice: Somos Live! A Concert For Disaster Relief on Saturday night (October 14) at the Universal Studios in Los Angeles. 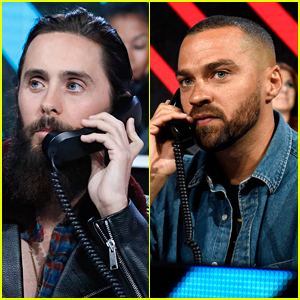 The stars answered phone calls during the telethon alongside tons of other celebs including Debra Messing, Eric McCormack, Seth Green, Marisa Tomei, Zoe Saldana, Ruby Rose, Benicio del Toro, Ted Danson, and Mary Steenburgen. 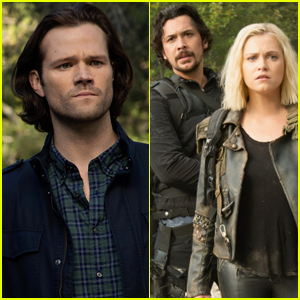 Go to SomosOneVoice.com to donate now. Selena Gomez & Vanessa Hudgens Join Forces for 'Somos: Una Voz' Benefit! Selena Gomez cozies up to Vanessa Hudgens during the One Voice: Somos Live! A Concert For Disaster Relief on Saturday night (October 14) at the Universal Studios in Los Angeles. The former Disney Channel stars were joined at the event by Victoria Justice and Gina Rodriguez as they took donations for Puerto Rico hurricane relief efforts. Demi Lovato also hit the stage to perform during the telethon. FYI: Selena is wearing a Khaite sweater and denim, Manolo Blahnik heels, and Ariana Boussard Reifel earrings. Kim Kardashian answers phone calls during the One Voice: Somos Live! A Concert For Disaster Relief on Saturday night (October 14) at the Universal Studios in Los Angeles. 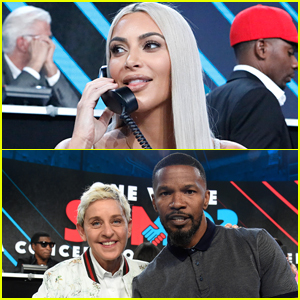 The 36-year-old reality star was joined at the telethon by Ellen DeGeneres, Jamie Foxx, Bethany Frankel, Derek Hough, and Tyler Perry. Jennifer Lopez speaks on stage during the One Voice: Somos Live! A Concert For Disaster Relief on Saturday night (October 14) at the Universal Studios in Los Angeles. The 48-year-old entertainer hosted the event in LA with boyfriend Alex Rodriguez as her ex-husband Marc Anthony hosted an event in Miami as they joined forces to raise money for the Puerto Rico hurricane disaster relief. 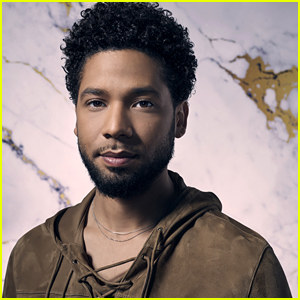 Entertainers like Demi Lovato, Gwen Stefani, Andra Day, Ricky Martin, Mary J. Blige, Chris Martin, and Adam Levine performed during the event. FYI: Jennifer is wearing a Romona Keveza dress.